Shiveluch (Sheveluch) volcano is one of Kamchatka's largest and most active volcanoes, and the one that has had the most violent eruptions. Highly explosive. Construction of lava domes and large pyroclastic flows caused by dome collapse. 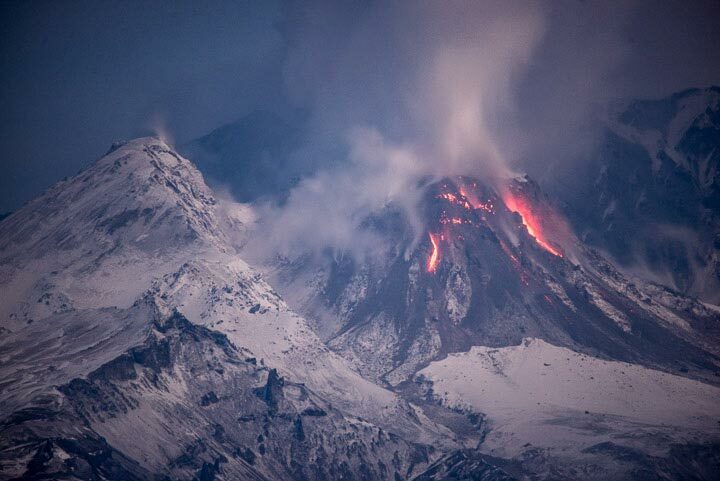 One of Kamchatka's largest and most active volcanoes. The activity at the volcano has been a bit lower during the past days, although overall similar to the past weeks. The lava dome continues to grow steadily. During the past nights, we observed frequent, but mostly small glowing avalanches from the active dome as well as small ash emissions and intense steaming. The upper third of the dome, now over 800 m high, seems to be active with many incandescent spots visible. No larger events (pyroclastic flows traveling beyond the base of the cone or explosions with significant ash emissions) have been observed since our arrival on 16 Mar. According to the volcano observatory, internal activity remains elevated, and the risk of a major dome collapse continues to increase. Visit our video channel on youtube! Divergent plate boundaries in oceans: Two ocean plates move apart from each other. Hot upwelling mantle material forms magmas that continuously produce new oceanic crust. An ocean widens.